Best Chocolate In West Palm Beach! Each and every edible work of artisan chocolate will arouse all of your senses. Oh My Chocolates creates these culinary works of art from the purest of ingredients. Our Signature Chocolates is individually prepared with premium quality chocolate. Jan. 30, 2013 - PRLog -- Valentines Day is coming up make sure you surprise your sweetie with something sweet so why wait celebrate your love for them today! By the way tell them Darius Alexander McDougle sent you they are one of the newest clients of The D-Style Graphic Solutions LLC in downtown West Palm Beach OH MY CHOCOLATES you will love it! Let us tell you a secret that we are letting out of the bag exclusively here on PR Log we are offering a number of free deals for this holiday season for you to share with the ones in your heart. Nothing says I love you better than the rich delicious taste of chocolate from our West Palm Beach Chocolate Store (http://www.ohmychocolates.com/) location. Truffles Assortment PRICES ARE BASED ON 1/2 LB PURCHASE. Elegantly wrapped in our custom packaging. We make the selection based on availability. 1/2 lb. $16.95. 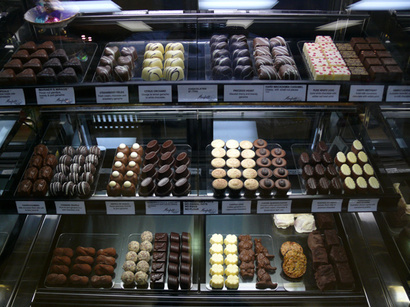 We offer some of the most amazing Gelato In West Palm Beach (http://www.ohmychocolates.com/gelatos.html). Make sure to come in today to our Downtown palm beach locations and try the variety of chocolates and fresh desserts we offer on a daily basis! Mention promo code D-Style and receive your free gift today. It is our mission to make sure that your experience is the best as possible. Our only wish is to have you say "Oh My Chocolates" once you finish your elegant and tasty treats. We are open late so we look forward to seeing you soon.